The results are in and Maple Grove collected a grand total of 14,580 plastic bags! 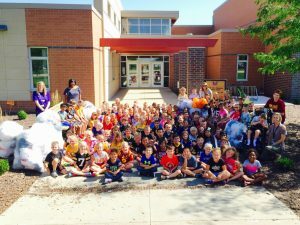 During the month of September first graders at Maple Grove Elementary held a plastic bag drive for their building-wide service project. The Waukee Fareway partnered with Maple Grove by donating bins to collect bags and taking the collected bags to be recycled. The service project was a part of the Build with Bags grant, sponsored by the Iowa Grocery Industry Association. Maple Grove was one of the recipients of the grant, which provided two playground benches and a picnic table for the school, all of which were made with recycled plastic bags by Plastic Recycling of Iowa Falls, Inc.
Raise awareness throughout the school about the importance of reducing the consumption of plastic bags. Educate students and families about the harmful effects plastic bags have on our environment. Encourage the use of reusable bags. Inform everyone about the importance of recycling the plastic bags we do use. They are very excited that they were able to collect so many bags while living up to their school’s goal to lead, learn and impact the world.